Made of Comfort-Ease, the newest generation of medical-grade high-density memory foam. 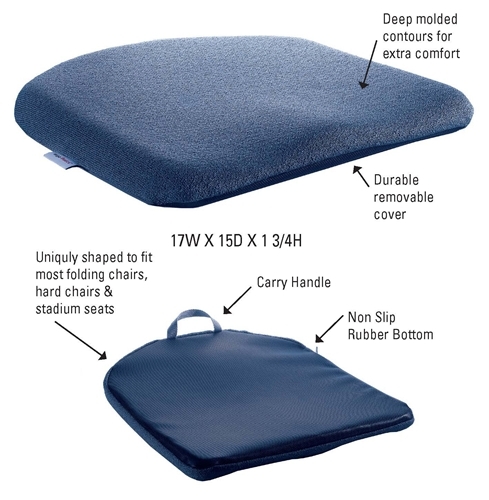 This versatile cushion is made of the newest generation of high-density memory foam to relieve sitting fatigue and pressure. Anatomic contour cradles your pelvis and legs for luxurious comfort and support. Unlike ordinary flat foam pads, this molded visco-elastic cushion hugs your body's contours. 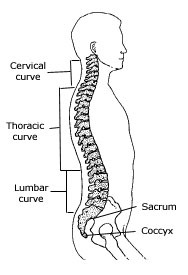 A slim profile adds support without a lot of height. 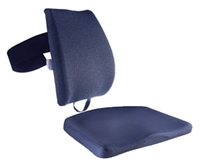 Converts to a coccyx cutout cushion if you have tailbone sensitivity or seek extra pressure relief. Just unzip and slide out the removable section. Recommended for hard folding chairs, deck chairs, dining chairs, office chairs and stadium seats. Looking for a larger cushion? We suggest the Comfort Rider Seat Cushion. Made with medical grade Comfort-Ease, the newest generation of high-density memory foam, for luxurious support. 100% polypropylene Teknit cover is cool and soft to sit yet durable enough for many years of use. Cover is removable and washable. High grade rubberized non-slip bottom. 17"L x 15"W x 1.75"H. 4 lbs.